Leadership Straight From The Horses’ Mouth! Business is changing rapidly and we all know that the old styles of leadership will no longer get you where you want to go. But how do you learn these new behaviours to help you lead in the fast-paced, ever-changing world that is the 21st century? adapt and become agile to survive in their surroundings. Some might say they have learnt to lead-on-the-hoof. The challenges the herd face daily mirror some of the challenges that business is facing today. They teach us how to stay grounded and present in times of chaos, and how to summon moment to moment calm, strength, focus, respect, and trust to maintain a mutually safe and beneficial working relationship. They offer immediate feedback about our presence, emotional intelligence, and body language. They model for us how to work as a real team, one where the leadership is shared, where communication is authentic and where the vision is crystal clear. How would you like these traits in your business? During this practical, interactive masterclass you will have the unique opportunity to work hands on with the horses to receive 100% unbiased instant feedback about your leadership style and the impact you have on others. Are you an inspiring, compelling and motivating leader who people want to follow? Are your behaviours aligned and congruent? Is your communication clear and effective? what you’re doing and experience a different result. There is no horse riding during this masterclass as all sessions are carried out on the ground and it doesn’t matter whether you have any horse experience or not. The opportunity for a breakthrough, whether in your business or personal life, is profound. This event is all about experiential learning, so you will also be participating providing feedback on what you observe. Julia Felton is a Change Catalyst and the Herd Leader at Business Horse Power Ltd, a company dedicated to supporting businesses with an entrepreneurial spirit to grow and become more productive and profitable. Uniquely, she partners with her herd of horses to help senior executive and business leaders to embed a shared purpose, evolve their leadership capability and empower team members so they can enable sustainable change in the workplace. Through experiential workshops, executive coaching and mentoring she encourages business leaders to challenge the status quo and step out of their comfort zone to see things from another perspective. She believes business can be improved through leveraging the wisdom of horses and applying the laws of nature where there is no wasted time, energy and resources. Julia has a 25-plus year proven track record in business with companies like Arthur Andersen and Deloitte. This extensive background in business enables makes her a master translator when running her workshops with horses as she can easily translate what is happening in the barn back to the boardroom so that clients can readily appreciate the practical application of the business lessons they experience. Julia is also the author of two books: Unbridled Success: How The Secret Lives Of Horses Impacts Leadership, Teamwork and Communication and The Alchemy Of Change: Ancient Wisdom Re-Invented To Unlock The Potential Of Leaders and Teams. 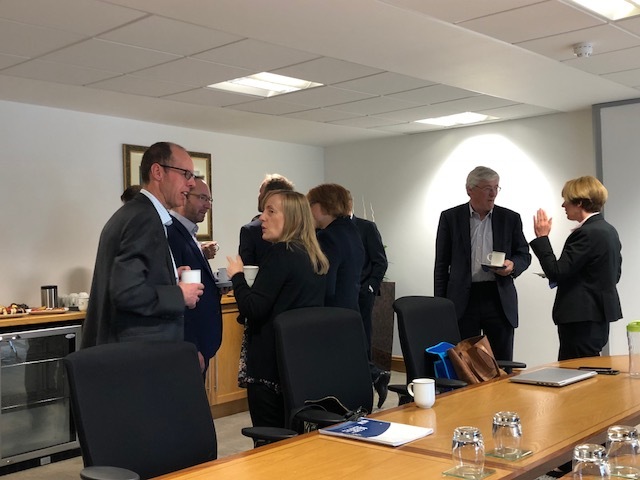 Thanks to all who attended the last Yorkshire Lawyer Leadership Group on 10th May. As always lively debate on the challenges faced by the legal sector and the roles Managing Partners have to play. The next and final meeting for this 2017/18 season will take place 5th July at Carrwood Park. Denis and I look forward to seeing you there. The Yorkshire Leadership Group (which I run with the wonderful Denis Kaye) and Professional Marketing Forum (where I am Regional Director for Yorkshire) partnered last week with the Leeds Fashion Ball @FBFashionBall. The star studded, black tie event is organised by Lisa Darwin @eventium and manages to combine great people, glitz and glamour with a very relaxed atmosphere. Around 1000 of the good and the great are there from most of the Professional Services world and Lisa even manages to persuade employees from Managing Director to trainee to model on the catwalk. I organised a table including Chamberlain & Co Insolvency Practitioner, Hudgell Solicitors, Northern Media and HR180 and their guests over from Ireland, the PM Group. Even though a few of us had ridiculously early starts the following day, including two flying at 7am back to Ireland, I am pleased to report that at least some of my trusted cohort made it to the aftershow party until the wee hours!! I was delighted that two of my clients joined in the modelling and strutted their stuff with aplomb. 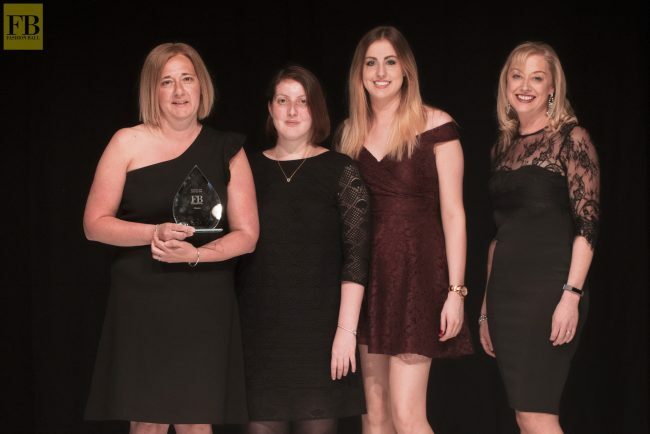 I presented 2 awards on behalf of the Professional Marketing Forum for Marketing Team of the Year which went to Clarion Solicitors (pictured) and Social Media Team of the Year which went to Resource – congratulations to both companies. All in all a great night, Lisa’s enthusiasm is infectious and I can thoroughly recommend this to firms for their client and staff alike to see that the professional services market are completely approachable and able to let their hair down away from the day job. The Yorkshire Lawyer Leadership Group will be running its next session 10th May.